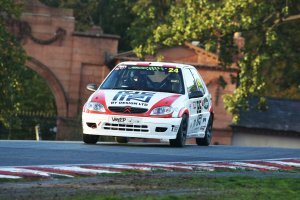 A pair of top-ten finishes in the final two rounds of this year’s BARC Junior Saloon Car Championship ensured that 16-year old racing driver Moh Ritson from Leeds ended is first full season of motorsport on a high note. 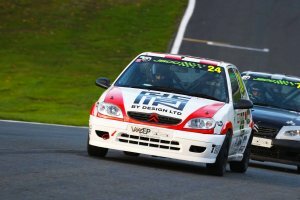 The two races at Oulton Park in Cheshire on Saturday (20th October) saw the teenager deliver two copybook performances and, battling hard against the other 14-17 year olds in identical Citroen Saxos, was rewarded with a pair of ninth places and a car without a mark on it – no mean feat following such exceptionally close racing. For Moh, Oulton Park represented another un-charted venue and another new challenge. Therefore, the time spent testing on Friday with driver coach Sarah Moore was time well spent and the official practice session on Saturday morning highlighted Moh’s ability to absorb information and learn his way around racetracks quickly. With the ambient temperature changing before Qualifying later that morning, grip levels around the 2.69-mile International configuration of the circuit had changed from that of the earlier practice and Moh posted times that would see him start from 12th and 11th position respectively for the afternoon’s two races. Whilst not as close to the front of the grid as he would have liked, as usual Moh relished the thought of fighting his way through the field. Making the most of his lightning-sharp reactions, Moh made a quick getaway in Race one and claimed a position by the time he reached the first corner – and then another by the end of the second lap. He then found himself with an uncustomary clear track and with good space around him was able to post a series of consistent times and gain further experience of one of Britain’s legendary racetracks. His pace coupled with a solid performance gained him another place before the chequered flag and Moh crossed the line to claim a worthy ninth place. Remarking that he was happy with the car and the way it had been set up by the Tockworth Motorsports team, Moh was eager to build on the outcome of race one and as such, got off to another flying start. However, with the championship at stake, double points on offer and nothing in it between the front-runners, the opening stages of the season finale were always going to be a frantic affair. Consequently, Moh found himself squeezed out at turn one and wasn’t able to make his usual first lap progress up the order. Even so, he began to make headway on the second. But then, at the end of lap four, the appearance of the red flag due to a coming together between two other competitors brought proceedings to a temporary halt. After the track was cleared the race was restarted some 15-minutes later and, with only time for a further two laps, a fairly intense few minutes followed. Moh found himself locked in battle with the drivers around him and executing a perfect exit out of the final corner, was able to pull alongside the car ahead of him. It was neck-and-neck as they sprinted towards to the finish, but Moh had the momentum and edged ahead to claim a thrilling second ninth place of the day as they crossed the line. “This was an exciting way to end the season. The racing was close and fair with no contact. These final two races have been a great way to sign off 2019”, said Moh. “It’s been a fantastic day and I have loved driving this circuit. The variety of corners together with the elevations and compressions give it so much character. Details of Moh’s 2019 campaign will be announced soon. Moh is 16 years old, lives in Leeds and was raised in the county of south-Yorkshire. His name is derived from the Indian name Mohan and is a nod to his grandfather’s Indian roots. 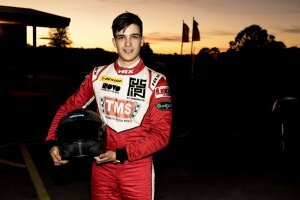 Moh has entered Junior level motorsports this year before he moves to senior in 2019. He studies at Woodhouse Grove School that is renowned for its strengths in sport and for supporting the development of confident, well-rounded young adults. Moh has a purple belt in MMA (Mixed Martial Arts) and has played Scrum-Half for local Yarnbury RUFC. He gave up competitive Rugby to focus on his driving and now keeps fit by playing squash and tennis at school. When he’s not racing, Moh unwinds by tinkering with an old SAAB or playing drums, having achieved a merit for his Grade 6 in drums recently. He won the school “Battle of the Bands” this year and has played at Leeds’ venue The Wardrobe, during Rock School UK performance nights. As Moh’s driving career progresses one aspect he wont find daunting is the travel, having already visited over 20 countries across four continents, often chasing photos of supercars for his @ritson.photos Instagram account.